When you’re looking for the best knives set to fit your needs, you will come across dozens of options. Spending a lot of money on kitchen knives isn’t always the best idea, especially if it’s mostly for home use. You might find a budget knives set that works really well, comes with a good looking block and a functional sharpener. However, in your quest for the best knives set you’ll need to do a bit of research. We did our best to narrow the best options down for you, and we put together a list of top rated knives sets. All of the sets we reviewed in the list below are hand picked and include some of the best options on the market. What you won’t find is sets that you shouldn’t be buying – all of the options are sets we would wholeheartedly recommend. Please keep in mind that most of these aren’t necessarily recommended to be used as chef knives – we have another top list for those. Without much further ado, let’s take a look at what we have. There are people who want to have practical and useful items in their kitchens. The Calphalon knife block set was designed specifically for that kind of person. Calphalon are possibly the best knives manufacturer around and can go head to head with any of the knives companies on our list. We have to start off by saying that this set is simply amazing – aesthetically and functionally. You can get this it as a 20-piece cutlery where you will get the most benefits from it. Namely, just like all Calphalon knives sets, you’d expect this cutlery set to be of highest quality and frankly, it is. The experts at Calphalon crafted it from the best materials for knives. This process results in a fully forged blade, tang and bolster. Within the process of manufacturing, they used high-carbon and no-stain steel from Germany. It is obvious that the sole purpose of all of this is to prolong the durability and minimize the chances of the Calphalon knife self sharpening set getting damaged. In the end, buying cutlery made from high-quality materials results in greater durability and performance. One of the things which make this Calphalon self-sharpening cutlery set unique are in fact, the handles. They add to the overall convenience and ease of use. Also, they make sure that you save time and have almost no issues when using the set. With this cutlery set, you will be able to say goodbye to the hand-pain after cutting a salad for more than two. Also, by having blades and knife handles of such quality, you also minimize the risk of ever getting hurt in the kitchen because of failed cutlery. The reason for this is that there is a full tang design on the handles. This means that the handles have contoured ergonomic features which ensure a secure grip, balance and overall strength in the Calphalon knife. Additionally, the handles are labeled on the end. Of course, this means that you will know which knife you need to pull out of the block each and every time. Also, we have to mention the quality of the blades included in this Calphalon knife set. Again, we are talking about solid and sharp knives. The sharpeners which are built-in are only an additional benefit to you. This makes sure that these blades are made to last. Once you get them, you won’t be needing any other cutlery set for a very long time. The set includes knives of every kind. From slicing knives to chopping knives or a paring knife – you will surely find a knife to meet the tasks of your day-to-day cooking. Amongst other things which are great about this contemporary cutlery set, we have to mention the innovative knife set self sharpening Sharp IN technology used in it. In general, this technology means that there are built-in sharpeners inside the block. These knife sharpeners automatically sharpen the straight edged knives after using them. All in all, this means that these knives are simply made to last. This technology is well-thought-out and it doesn’t have a negative effect on the quality of the knives. In the end, this is a durable and reliable cutlery set of superior quality. Preparing meat or making salads with it will surely be a seamless and enjoyable activity. As a matter of fact, this isn’t just he best option overall, but is also the best meat meat cutting (or in other words, butcher) knives set on our list. If you want to feel like a professional in the kitchen, you should have a stainless steel knife set. Sure, a wood handle kitchen knife set works well too, but stainless steel is often preferred. The Chicago Cutlery Insignia knife set is the product to have in your shopping cart. We are talking about 19 piece insignia steel knife set. There are a lot of reasons why this set would be amazing for your kitchen. For example, it comes with a great in-block sharpener and a wooden cutting board. It surely allows an ultimate meal-prepping experience. like a professional. However, you will also cook and prep food as a professional. The quality manufacturing on the set makes sure that prepping meals relies on accuracy, efficiency, and strength. So, whoever is a gourmet and likes a professionally prepared food will surely enjoy this block knife set. Once you have them, they will surely be the only cutting set you will use. Of course, you will be able to use them for a very long time. After all, they do come with a lifetime warranty. The Chicago cutlery set includes shears, a 3 inch peeling knife, 5 inch utility, 6 inch boning knife, 3-1/4 inch parer, 8 inch serrated bread, 7 inch Santoku, 8inch slicer, 8 inch chef, eight steak knives with dimensions of 4-1/2 inch. Also, it includes a block with built-in sharpener and cutting board made of bamboo wood. As we said before, this set is excellent for professionals and those who want nothing less than perfection. What meets the eye is not always the most important thing. However, it is simply not something we can overlook in the case of the Insignia cutlery knife block. The reason for this is that the set has a satin finish which makes them pleasing to the eye. The high-carbon stainless steel makes sure that they look professional too. Because of the ergonomic design, they also have a unique feel and design. In the end, besides feeling strong, balanced and nice on the hand, they look good too. On the other hand, the quality of the blades is far from disappointing. As we said, the blades are made from high-carbon stainless steel. This makes the blades very strong while being incredibly resistant. You will not have to worry about stains, pitting or rusts on the blades anymore. Once again, this proves that these durable blades are made to last for a lifetime, just like the warranty. Lastly, we have to mention the sharpening feature and the cutting board. We already said that this 19-piece knife block comes with an addition of a block and an in-block sharpener which are very durable. Additionally, it comes with a fancy, yet sturdy, cutting board. All of this makes sure that you will have a rather pleasant experience when using this set. Also, with the exclusive taper-edge grind sharpening feature, you will save time and your knives will be as sharp as they can be. All you need to do is take them out of the block and you are good to go. All things considered, this Chicago Cutlery set is a great choice! The Wusthof Knives Gourmet set is something that will completely satisfy your cooking and meal prepping needs. They are of high quality and they are knives you can completely rely on. More importantnly, the set contains every cutlery item you might need to use – ever! 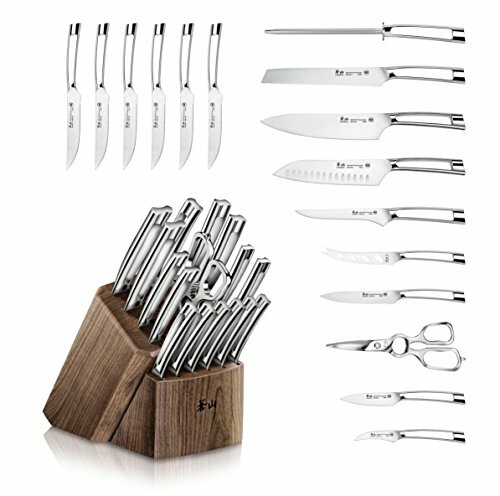 Namely, the Wusthof knife set has 12 knives. In fact, what you get are a 2 1/2 inch parer and a 3 inch parer. Also, you get a 4 1/2 inch utility knife, an 8 inch bread knife, an 8 inch cook’s knife, and four excellent steak knives. Additionally, you get a 9 inch honing steel, kitchen shears. Of course, you also get a 13 slot Wisthof knives block. This means that your knives will be well-organized and quite convenient in the knife holder. Of course, the most important thing about each knife set is the quality. We all know that good quality mostly comes from the materials being used in the knives. Wusthof is a reputable brand for making high quality knives. Namely, these Wusthof knives sets are made from a unique mixture of German stainless steel and high carbon. They manufactured them like this in order to improve the overall balance and strength. Additionally, the combination of materials results in amazingly sharp edges because of the precisely tempered blades. Of course, you know that you can expect nothing but ease the next time you are prepping meals using them. It’s also worth considering that the precision blades feature a razor-sharp edge. This one is well-made and resistant to rust and stains and they have amazing balance. This is because all of the knives have a full tang. It extends from the knife tip to the end of the handle. knife set. Namely, the materials are lightweight and these knives are far from heavy. Although they might feel a bit flimsy to the hand, it is quite the opposite. They are extremely durable and resistant and you can rely on them completely. Additionally, this means that you won’t feel discomfort while you are using them the next time. Overall, you can expect professional-level quality from these knives. They are worth much more than what you pay for them. Also, this is why they are an excellent purchase. You will be able to accomplish tasks involving cutting with confidence and with ease. Since they are the essentials a kitchen should have, they will easily become your favorite items in the kitchen. There are people who know the value of good design and we appreciate that. Namely, you don’t need to choose one apart from the other. With the Shun knives sets, you can have it all. This set has a lot of features that simply make it unique and reputable. For example, these knives are a lot more attractive aesthetically compared to many other types and brands. The buyer can get to know them easily and be satisfied with them from the moment they open the box. Although they come from the Shun Knife Classic series, they are far from average. They have all the features and specifications a professional chef would demand. For example, the whole knife with stand set includes a lot of knives for all the different reasons. Namely, it has a 3.5-inch Paring Knife, 4.5-inch Honesuki Knife as well as a 5-inch Hollow Edge Nakiri Knife. It also has a 6-inch Utility Knife and a 7-inch Santoku Knife. Moreover, you get an 8-inch Chef’s Knife together with a 9-inch Hollow Edge Carving Knife. Lastly, the set has a 9-inch Combination Honing Steel, Shun Multi-Purpose Kitchen Shears and a 13-slot Deluxe Bamboo Shun Knife Block which is an excellent display knife stand. One of the greatest features of this set are the materials used in them. Namely, these knives are made of two types of metal, VG10, and high carbon stainless steel. By combining these metals together, the manufacturer managed to create a stronger, more durable, lighter, and more stain resistant cutlery. Also, they have 34 layers on both of the sides of the knives. Also, there is a stainless Damascus cladding for improving the overall quality of the set. Additionally, these knives feature a Rockwell hardness. In order to improve the durability and performance on the blades, they are also hand-sharpened and feature a Japanese double-bavel blade knife angle of 16 ° on each side. This makes sure that the edge is as fine as it gets and it is incredibly sharp. Another benefit from them being hand-crafted in Japan, Seki is their overall quality. The manufacturer is well-aware of the quality knives they produce which is why with these blades you get a lifetime warranty. Another astonishing thing about them are the handles. We are talking about D-shaped PakkaWood handles which are incredibly strong. As an addition, you don’t have to worry about these handles failing you because they are extremely durable. An interesting part about them is the fact that they resist moisture. Anyone regardless of how often they cook has heard of the Mercer Culinary name. After all, this is a world-wide known manufacturer in the cutlery industry. They have been around for more than 30 years. This is how they managed to know the actual needs of their customers and how they make sure to satisfy them. It is also why a lot of chefs and industry professionals completely rely on their products. Also, it is the reason why we must talk about Mercer Culinary when we are talking about the best knives set. Namely, this Mercer Chef knife set is excellent for beginners and professionals. It is also excellent for those who want to upgrade and take their knife collection to the next level. Regardless of how long you use them, you will always be impressed by these knives. Even though they might seem a bit bulkier than the average knives, they have a lot of benefits to offer. They feel excellent in the hand and more importantly, they are reliable. There are a lot of things which can be found as beneficial from this set, but durability is probably the greatest one. You also get the stunning Mercer knife block, made of tempered glass. If we take into consideration that these knives are made from precisely forged German steel, we can easily make a conclusion about their durability. They are well-crafted and they resist corrosion, rust or even discolor. They use high-carbons steel in the process of making these knives and this also has other benefits too. However, this still means that you need to take proper care for them. On the subject of the balance and comfort of the grip, there are few important things. For example, at first impression, the grip is a bit bulkier or heftier compared to other similar-quality knives. This might result in some discomfort at the beginning. However, once you get used to it, you will surely realize that this larger grip makes sure that you have enough balance. After getting used to the grip, you will feel as they fit perfectly in your hand. Also, the knives are built with substantial bolsters. These bolsters make sure that there is perfect balance on each knife. Additionally, chopping, mincing, dicing and slicing is a lot easier because they weight more too. This means that the knives practically glide through meat and other types of food. You will notice that cooking and prepping food has never been such effortless activity. This set basically includes every knife you can possibly need in the kitchen. In the case of Genesis – less is better. With these six knives, you can practically do anything. By getting this set you get 8 inch bread and chef knife. Also, you get 5-inch utility and paring knife as well as a 6 inch boning knife. Of course, you also get a practical and stylish knife block. It doesn’t have a knife sharpener, or a knife bag, but you pay for the knives, and that’s very much worth it. Those who seek practical cutlery sets will surely be fond of the Ginsu Essential set. Ginsu knives sets are everything a person who likes saving time needs. First of all, they are made to be very convenient and useful. This is why from the moment you buy them, they come completely sharp. More importantly, you never need to sharpen them at all. It also means that you won’t have to spend time for maintenance on them. Also, it means that if you aren’t a professional in these things, you won’t lose any nerves on non-sharp knives. And the most important part is, this is just the tip of the iceberg. There are other features which make this set an excellent purchase and a great investment. For example, each of the Ginsu Essential knives feature Scalloped Serration. This means that these kitchen knives can handle basically anything. They are well-crafted and designed in a way to prevent them from getting damaged. It also means that they can take up any task you put them through. Cutting up a side of meat or slicing vegetables – they are excellent for the job. You won’t even use too much energy as they are well-made. Another great benefit from this Ginsu knife set is the fact that they are full-tang triple-rivet knives. In general, this means that they are very safe and comfortable. Additionally, they are very easy to use and they don’t cause discomfort to the hand. This is true even if you are using them for prepping a meal for a lot of people. In fact, the ergonomic engineering makes sure that your hand is in a natural position. This also keeps you safe and free of unwanted pain or possible cooking injuries. Whatever you are preparing: simple or complex and large meals – this knife set has it all. By getting it you get an 8-inch chef’s knife as well as same sized carving and slicing knife. Also, you get a 5-inch boning knife and a 7-inch Santoku. Lastly, you get one 4.5 inch utility knife and not one Ginsu steak knife, but six 4.5 knives and a 3.5 paring knife. Of course, you get an excellent pair of kitchen shears as well as an elegant and natural-looking Ginsu knife block to keep them organized. One cannot possibly go wrong with a set like this one, it has all the features a non-professional might have. It is an excellent bargain and they are worth your buck. After all, with them, you get quality without overpaying for it. There are reasons why people would prefer having the Hampton Forge knives set and frankly, they aren’t wrong. This set of continental knives manufactured from the Hampton Forge is a sight for sore eyes. They bring a lot of benefits on both aesthetical and functional level. For example, they come from a reputable manufacturer who simply knows what they are doing. This is why this specific Forge knife set can satisfy almost every need a person can have in their cooking activities. The set makes sure that the person using them has good time without any great issues due to bad cutlery. Additionally, having a good and high-quality Hampton cutlery set like this one makes sure that the food prepping activities are a piece of cake. You can mince, slice or dice without breaking a sweat. This is simply the set you get once and you never want to or have to replace again. It is durable and once you have it, you will use it for a very long time. Additionally, it offers such performance and comfort, which makes you never want to change or replace it. When we talk about the comfort of use, we must mention the incredible ergonomic design featured in the Hampton Forge Continental set. The sleek look is just for the eyes, for the hands, there is a special process of ergonomic engineering. These knives are counter-balanced and they have ergonomic handles. They fit perfectly in each hand and they don’t cause any discomfort. Regardless of how much pressure you are applying on them or for how long have you been cutting-you won’t feel a thing. Performance-wise, this set features a full-tang and triple-riveted forged blades. Additionally, it features a generous bolster and an excellent counterweight. In the end, this means that these blades are made to last and to maintain their performance. You will surely be satisfied with them years after using them. Moreover, these knives feature precision taper-ground blade edges. This means that these blades stay sharp for a very long time which saves you a lot of time on maintenance and sharpening. So by getting the set, you get an 8 inch chef knife, 8 inch bread knife, 8 inch slicer knife and a 6 inch utility serrated knife. Additionally, you get a 5.5 inch Santoku Knife and a 3.5 inch paring knife. Lastly, you get 6 Hampton Forge steak knives together with shears & blade Sharpener. Of course, you also get a 14 slot Hampton knife block to make sure that you have your knives well-organized. It is a well-known fact that the Victorinox cutlery is a professional-grade cutlery. Regardless of who or how testes their products, they seem to excel in every field. They are probably one of the best products in the world too. This is because the manufacturer has years and years of experience and constant improvement. However, probably the best thing about this manufacturer is the fact that even-though their products are professional-grade, they can be bought for personal use. Of course, this should mean that considered the quality, these knives sets are far from being too pricey. So, this is why we have to talk about the quality of the Victorinox 4-piece knife set with Fibrox handles. Just like other Victorinox knives kitchen set options, these too feature high-carbon and stainless steel blades. Also, they are hand-finished in Switzerland by one of the best and most-skilled craftsmen in the field. Additionally, there is a special tampering proves involved. This means that the edges are produced in a way which allows resparpening them again and again. All in all, this means that the blade maintains the initial sharpness throughout its whole life-time. Additionally, the manufacturing process involves some innovation in the handles too. They are designed with the specific reason of minimizing wrist tension. Moreover, this means that they are an excellent fit for most hands too. Comfortable and positive grip, as well as a good heft, is the first thing that the user notices. In the end, this is clear proof that the knife is well-made. NSF approved Fibrox handles. We all know that cutlery steel should naturally be sanitary. However, constructions details and certain materials used in the handles can be excellent hiding-places for bacteria. With the Victorinox, this will be an issue you have already solved. By getting the Victorinox knife set, you get an 8 inch chef’s knife and a 10-1/4 inch bread knife. Also, you get a 6-inch utility knife and a 4 inch paring knife. It is an excellent gift for others or for yourself, and has all the commonly used knives found in professional kitchens. It can definitely satisfy a lot of your needs, and the Victorinox knife price is lower than you’d think. The only downside is that you don’t get one of those Victorinox knife blocks. While other manufacturers design knives with specific needs – of professionals or newbies in mind, the Schmidt Brothers are different. They seek to perfect productivity and functionality of their knives, be it the Schmidt Brothers steak knives, or any other ones. This is why, in most cases, their knives are of extremely high-quality and the price is very reasonable. They seem to understand what each customer wants. For this reason, they create knives which anyone can use and actually afford. With the Schmidt Brothers Titan cutlery set, you can finally get a good set of knives without butchering your budget. Just like their other sets, this set is designed for those who want good and functional knives fitting their needs and their budgets. The design has a lot of meaning to the buyer in most of the cases. Of course, if you are equipping a new kitchen, you would want your block of knives to be fitting in the environment. However, besides aesthetical reasons, design has other meanings. The design has direct impact on the user of the knives. So, this is exactly the reason why we need to talk about this subject in-depth. Material-wise, these knives feature a high polish and more importantly, pure titanium black coating which is the first step towards perfection. Additionally, the Schmidt brothers used 100% German stainless steel in the process of making these knives. This, in the short run, means that your knives will look very fabulous and they will be able to resist almost anything. They won’t get easily scratched and they will not get rusty. On the long run, this means that your knives will maintain the quality they had from the beginning. They won’t fail you after a few years too. This is why it is safe to conclude that this set is an excellent investment, just like many other Schmidt Brothers cutlery sets. On the other hand, all the materials combined in these knives are resistant to rust and to stains as well. Additionally, we have to talk about the design of the bolster, the balance as well as the handles. First of all, the handles are soft-gripped and include rubber in them. This makes them ergonomically designed and it is how they add comfort to using these knifes. Also, the knives feature the patented curve. This means that you can use your forefinger to actually guide the blade with increased precision. You will also have more control on the knife. Buying the full Schmidt Brothers knife set will get you a 9 -inch bread knife, 8 inch chef’s knife, 8 inch slicer and a 7 inch Slim Santoku. Also, you will get 7 inch boning knife a 6 inch Tomato/Bagel cutter and a 4 inch Paratoku, along with six 5 inch steak knives. Also, you will get a 2-stage Schmidt Brothers knife sharpener, which looks stunning. This amazing set by Cangshan knives simply changes the knife-game. It brings a lot of benefits and new tricks to the game you will be surprised. It is made to satisfy almost all needs and to meet all the expectations from any buyer. Regardless of how much of a cook you are, you will surely be amazed by this Cangshan knife set. This N1 series cutlery set features six knives designed and engineered for maximum performance and comfort. Also, they are very durable and reliable. They are simply an once-in-a-lifetime investment. Once you have this Cangshan set, you will never want any other knives. Luckily, you won’t need to look further because they are made to last for a lifetime. The first thing we must mention regarding the uniqueness of these knives is the design. Namely, we are talking about a unique all metal design which has a patent pending. The design has the purpose of improving the ergonomics of the handles too. Also, these knives feature a modern and sophisticated Acacia wood block for excellent organization. It makes the knives look overall well-designed and stylish. More importantly, each block from the Canghsan cutlery set is hand-crafted with maximum attention for greater durability. The knives feature German high-quality steel which only adds to the overall greatness of these knives. In fact, they have HRC of 58 +/- 2 based on the Rockwell Hardness scale. This is only another proof of how good these knife actually are. You simply know that from them you can expect nothing less than excellent and impeccable performance. Overall, the set includes an 8-inch chef’s and a7-inch Santoku as well as an 8-inch bread, a 5-inch serrated utility knife and a 3.5-inch paring knife. As we said, you also get a block for maximum organization and style in your kitchen. Last but not least, we have to mention that this set has been approved by the NSF (National Sanitation Foundation). What is the best kitchen knife set to buy? Regardless of who you are, a professional chef or a home cook, you should have a good knife set. After all, these are invaluable tools which we use for every-day preparation of meals. This is why it is important to make a small investment about them. We all know that the cheapest is not always the best, and this is exactly the case with knives. Of course, we don’t mean that you should overpay, but make a small investment for a decent set of knives. And if you properly maintain them and care for them, they will last for years. When it comes to the question of which and what is the best kitchen set to buy, there is not a correct answer. The main reason for this is the fact that there are a lot of knife sets on the market. These are different based on price, design, performance and specific purpose. Some knives are excellent for cutting meat and others are very comfortable. This is exactly why the market is almost overwhelmed with manufacturers and knife sets. However, this does not mean that each and every one of these knife sets is suitable for an investment. After all, it is better to buy a whole cutlery set instead of buying each blade separately. This saves you a lot of time, energy and in most cases – money too. To know what you want and what you need might seem like an easy task. However, when it comes to kitchen knives this is not the case. It could’ve been an easy task when you were buying cutlery sets as gifts for others. But, when you are investing in such a set for your needs, you should be a lot more observant. This is why we will help you and ease your decision-making process when it comes to kitchen knives. In this case, we have to mention a great stereotype. Purchasing from a well-known brand names doesn’t necessarily mean that you will get reputable quality. In a lot of cases, you should have the brand name as the most unimportant priority. To know which knives set is the best, you must look at it from the aspect of your needs. You need to think it through in-depth and make a list of requirements. If you have specific needs or demands, the best cutlery set should meet those. Also, you must take into consideration the quality of the materials, as well as durability. You may also want an economy option, in which case you’ll need the absolute best budget knives set. Lastly, you must take into consideration the amount of time you want to spend on maintenance of your knives. This may sound a little silly, but it’s not to be taken lightly. Picking a kitchen knives set, as we said, takes time and energy. This is why you need to be careful and you need to think it through. Also, there are certain things you need to take into consideration. These things would include the essentials of the good knife like blades and the quality of the essential pieces. Also, you would need to consider the overall design and construction on the blades. There are some knives which don’t have proper weight or balance and this can be an issue in the long run. Another very important thing about a blade is its handle. The quality of the handle can ruin the overall experience and it can cause problems like injuries or hand and wrist-pain. In the following text, we are going to talk about which elements contribute to the overall quality of kitchen knives and kitchen sets in general. The first and most important thing is the way the blade can be handled. This means that the blades you are intending to buy should have a comfortable grip. Another thing which corresponds to this feature is the weight. It is a subjective aspect but you should choose a set of knives which don’t feel heavy on your hand. Moreover, you should consider the quality of the materials. Think about your needs and learn which of the variety of materials are fit for your needs. For example, some might need carbon steel while others would need something like stainless steel, ceramic or high-carbon stainless alloys. Lastly, the construction should be steady and reliable. This means that the overall set will be safe to use and that it won’t pose any danger to anyone. When you take everything into consideration, getting the best knives set isn’t that easy. There are a lot of things to consider. From the quality, to the brand name, and price, you’ll need to read a few reviews before you pull the trigger. With the options and guide below, we hope we have made this much easier for you. Making an informed buying decision is essential, from a new car, to the best steak knives set, so go ahead and make it!